APPSC Degree Lecturer Recruitment Notification 2018: Apply for 200 Degree lecturers @ ap.gov.in. 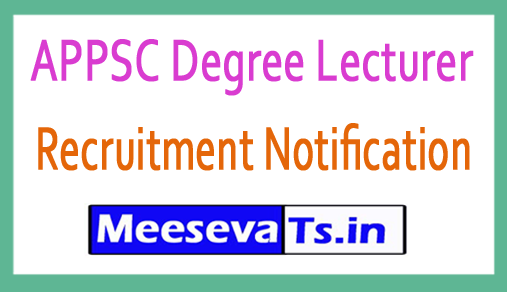 Andhra Pradesh Public Service Commission will recruit the degree lecturer through APPSC degree lecturer recruitment 2018. Interested and qualified candidates who wish to apply this recruitment, can apply online at their official website ap.gov.in. The full details of this recruitment are available on their official website and meesevats.in also provides complete information about this notification. Educational qualification, application process instructions are outlined below for implementation. Selected candidates will receive according to the organization's rules. Look around for the "APPSC Recruitment 2018 for degree lecturer posts". Please pay the application fee. Click Submit button for last submission. Save and print out for future use.